Wimbledon chief executive Richard Lewis says Andy Murray's match against Marin Cilic was held on Court One because it was his turn to play there. Rain interrupted the fourth-round match on Monday while play continued under the roof on Centre Court. "Andy has to have a turn on number one court," said Lewis. 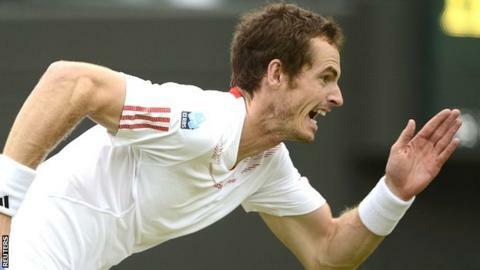 Murray, who beat Cilic to reach the quarter-finals, said: "I don't deserve to play all my matches on Centre Court. Someone like Roger [Federer] does." Lewis added: "He [Murray] was scheduled on number one yesterday. Once you've started a match on a court, you ideally finish it on that court. "That's a protocol that is pretty much understood around the world." "The All England Club might say they won't schedule night sessions, but by putting Murray on Centre under the lights at 7.30pm they were in effect doing exactly that. "A precedent has also been set that spectators now expect to see maintained. On Monday, with the roof on, the day's play was curtailed at 8pm despite Murray's match being unfinished, several other big ones yet to start and both conditions and crowd perfectly set for tennis." The match between Murray and Cilic came to a halt on Monday with Murray 3-1 ahead in the second set, having taken the first 7-5. Play resumed at 1210 on Tuesday, only to be stopped five minutes later with only two games being completed. They restarted at 1310 and Murray won 7-5 6-2 6-3 to set up a meeting with David Ferrer. The Wimbledon authorities have been criticised for not scheduling the game for Centre Court, where the roof has been in frequent use due to the poor weather that has blighted the tournament. But the British number one said he did not expect to be treated any differently from anyone else, despite being a home player. "I don't think just because you're from that country you should get preferential treatment. All of the players would say they would rather play on Centre because they know they're going to finish their match," said the fourth seed. "But I hope that I play my next few matches on Centre." Lewis added: "We're certainly not being biased in one direction or another. We're just trying to make the right call on each individual situation. "There are huge, huge issues moving a top player from one show court to another show court. That genuinely creates safety issues." Lewis is also hopeful of avoiding play running on to next Monday. He said: "We might get a lot of matches finished on Wednesday which would help. The forecast is pretty good for the next couple of days. "It's dry and we could get a lot of matches played over the next couple of days and the issue of playing on a third Monday would go away." Wimbledon: Who will Murray have to beat to win? Read more on Wimbledon: Who will Murray have to beat to win?